There are a lot of variables that come into play when you’re cooking with a campfire, so play around and experiment. Keep an eye on your Campfire Roasted Vegetables as they’re cooking and pull them out when they’re the texture you enjoy. 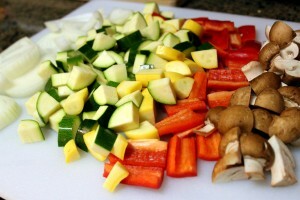 This recipe has roughly 6 cups of veggies, so would make a nice side dish for at least 3-4 people. Add whatever vegetables, herbs and spices strike your fancy. Make a fire and put some coals off to the side, away from the flames. Toss your veggies into a shaped bowl of heavy-duty tin foil and thoroughly cover them so that the smoke from the fire doesn’t get inside. Put the tin foil boat in a pocket of coals and after about 7-8 minutes, check every few minutes to make sure you don’t over-cook them. Disclaimer: Fire is hot! As is steam, so be careful. Make sure you have an apparatus to help you get the tin foil boat out of the fire. Don’t try removing it with your bare hands. Remove when the vegetables are ready and enjoy!